ThermalTake shows off a bunch of new mid-tower cases; this includes the Thermaltake Versa J J22, J23, J24, and J25 TG RGB Edition, as well as the V200 TG RGB Edition. 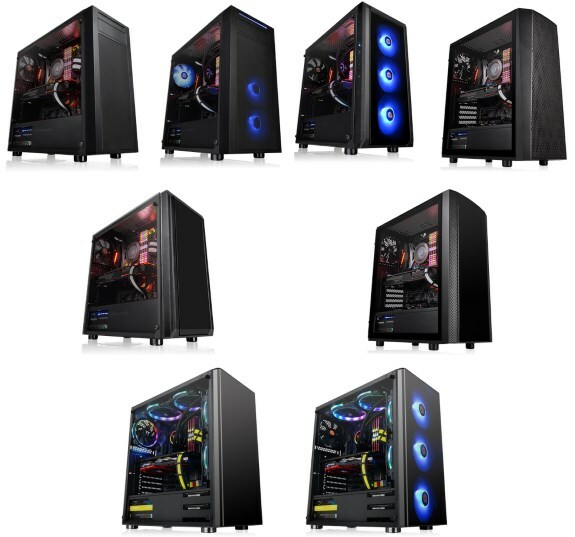 You can find the specifications of each model via ThermalTake's website. Thermaltake, a leading premium gaming tower manufacturer, announced the immediate availability of the Thermaltake Versa J Series, including J22, J23, J24, and J25 TG RGB Edition, and V200 TG RGB Edition Mid-Tower Chassis. The Versa J Series are designed to satisfy PC builders with different preferences regarding case style. For better ventilation, the J22 TG RGB comes with 3 built-in 120mm 12V RGB fans, two at the front and one at the rear. The J23, J24, J25, and V200 TG RGB come with 3 built-in 120mm 12V RGB front fans. And all the 3 built-in 120mm 12V RGB fans are dual-mode controllable either via the I/O port RGB button or the synchronization with enthusiasts’ favorite RGB capable motherboard brands, including Asus, Gigabyte, MSI, ASRock, and Biostar. Furthermore, the All-in-One (AIO) Liquid Cooler products are a perfect match for the J Series and V200 TG RGB Edition. Finally, the TG Editions are also designed to meet every PC builders’ needs. Handy I/O Ports Including One Button to Easily Access Gorgeous RGB LED Illumination PC builders not only can find handy I/O ports on top-front panel of the Versa J Series and V200 TG RGB Edition but can spot one button that can help them easily access gorgeous RGB LED illumination. With lighting modes of RGB Lighting including Single Color, Breath and a range of different colour options, the Versa J Series and V200 TG RGB Edition are able to give PC builders a pleasant and unique user experience. Here's a look at the cases, overall the differences between most models are rather minimal.